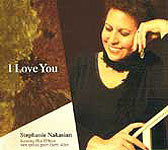 Stephanie Nakasian is a great gift to jazz buffsand especially to those who love singers. Not just for her exuberant performances but for her ability to articulate in layman's terms what it is to be a jazz singer. Her latest recording on V.S.O.P. Records, Thrush Hour, combines masterful singing, top-notch musicianship, and an educator's expertise to deliver a comprehensive "study of the great ladies of jazz, as the subtitle reads. On this release Nakasian approaches a generous number of vocal jazz classics in the style of the original recording artist, from Bessie Smith and Ethel Waters to Abbey Lincoln and Ella Fitzgerald. Along with each track is an informative biographical sketch of the original artist that places the music in its era and details its significance in jazz history. Few singers can tell you as much about where their sound comes from. The CD, recorded in two days (that's ten tunes a day), shows off the considerable chops of Nakasian's rhythm section: her husband Hod O'Brien on piano, Steve Gillmore on bass, Bill Goodwin on drums, and Howie Collins on rhythm guitar; and of her horn players, Randy Sandke (trumpet), Tod Hamilton (tenor sax), and John Jensen (trombone). The team borrows the arrangements from the original recordings, one assumes from reading the liner notes, but the presentation is fresh.